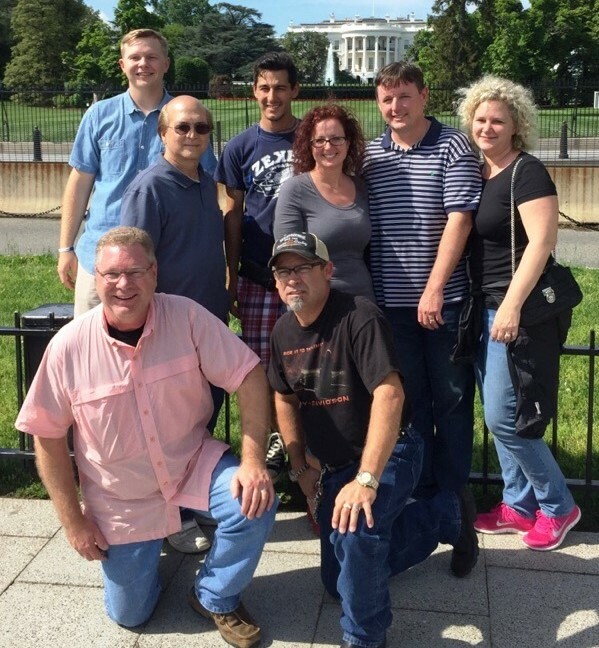 DZ, surrounded by family, was honored at 2016 National Polka Festival for serving as director. 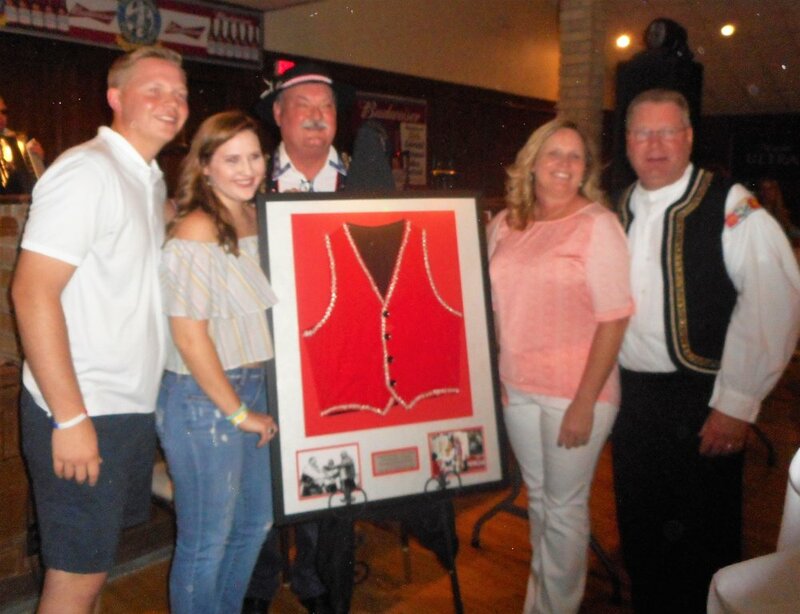 Former Ennis mayor Russell Thomas presented DZ with a framed vest that belonged to his dad. When you want to create an event to promote polka, who ya gonna call? Johnnie I. Kracja, who was recently honored by the Texas Czech Heritage & Cultural Center (TPN December 2016). he has received, mostly through email (dannyzpolkashow@yahoo.com). This is not DZ’s first appearance behind a radio microphone. He got his start as a polka DJ on Internet radio station WRJQradio.com out of Wisconsin five and half years ago. When it came time to choose a theme song, DZ went with Oh Clara Polka. “We (Czech & Then Some) were working on the Texas Tribute album to Ernie Kucera and I have always liked his recording of the song,” he said. “We decided to put it on the recording and got a great response from our fans. It’s a fun song to play and not many bands play it. It has good drive to it. The crowd always responds well when we play it. It’s one of my favorite polkas.” And, when he took over KBEC Polka Party, there was only one choice for the theme song - Oh Clara Polka. DZ continued to do the WRJQ show along with the KBEC Polka Party, until he got word the station wouldn’t be able to continue all its programming. “I appreciate Aaron Schuelke giving me the chance to be on his station without even knowing who I was. WRJQ is the best 24/7 polka station. 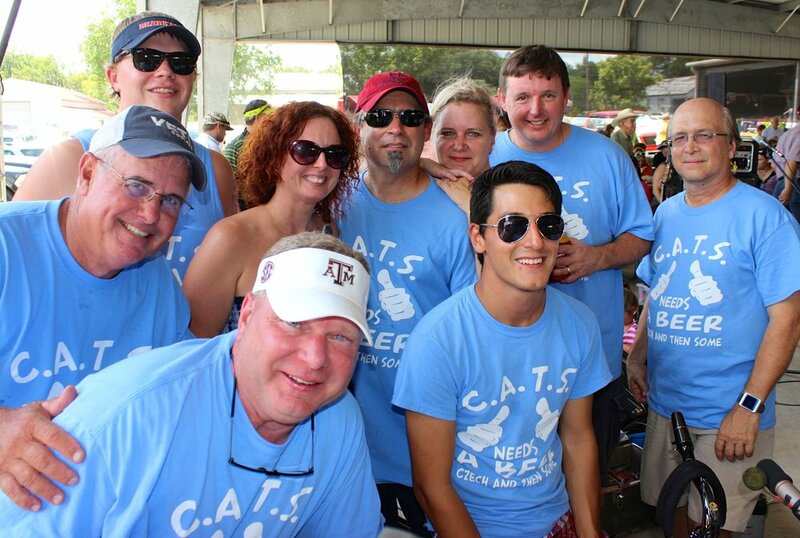 I think I can say I brought a lot of Texas listeners to the station,” DZ said. the station every chance I get,” DZ said. introduce the IPA and raise funds for the association that will soon celebrate its 50th anniversary. again gathered to raise funds for the association while celebrating Carl Finch’s (Brave Combo) induction into the hall of fame and the 20th anniversary of Czech & Then Some, led by DZ. 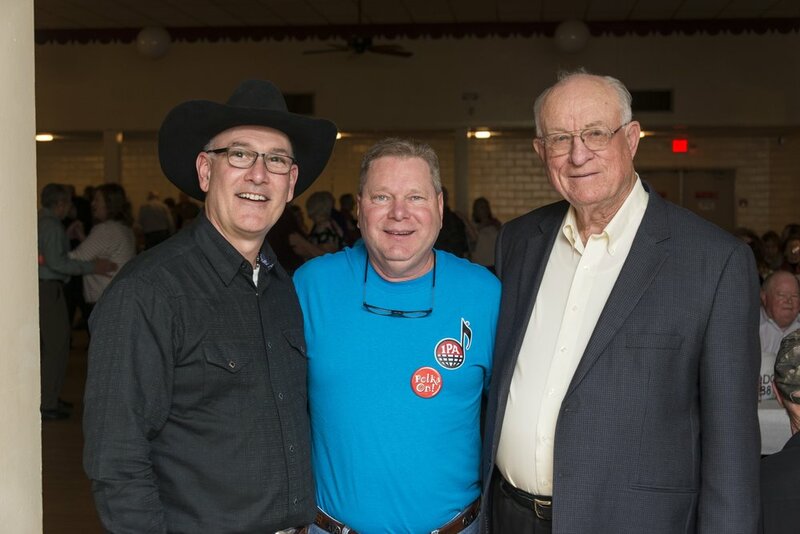 The dance was held Sat., Jan. 21, at the KJT Hall in Ennis. (See the photos). Not the Broadway musical, but the Ennis-based Czech music ensemble that celebrates its founding 20 years ago. To clarify, CATS is the acronym for Czech & Then Some, a seven-piece, multi-ethnic orchestra. The nickname came about when leader DZ’s wife, Yvonne, got tired of filling her calendar space with “Czech & Then Some” and started abbreviating it to reserve days for performances or practices. The actual name is a descriptor of the Czech music they play, and the “then some” refers to the other ethnic polkas and country music they play. CATS started out when Joe Betik, a good friend of DZ and David Slovak, asked David to play his accordion for his sister’s 50th wedding anniversary. 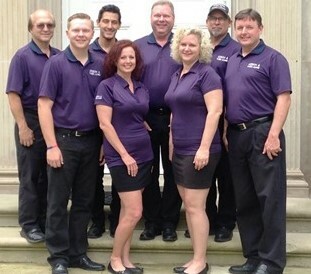 David recruited DZ, David Trojacek, Louis Valek, John Marek Jr., and Andy Mikula to assist him. The band didn’t even have a name, but after that gig, they realized that there was some musical chemistry happening. 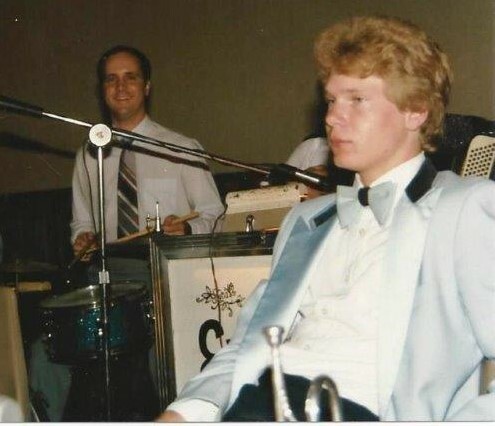 Soon afterwards, Joe Lansfeld, the president of KJT Society #35 in Ennis, as well as DZ’s father-in-law, hired the band to play for their annual KJT membership recognition dance. That confirmed it. acclaim around the Central Texas Polka Triangle (Ennis-San Antonio-Houston). What sets CATS apart is the use of the full arrangement of all the songs they play as opposed to just playing the chorus rendition of a song. natural” without mikes and amps. the band after having played with The Czech Harvesters a few years before; Zeke Martinez (2007), percussion and guitar, has a background in Tejano music. 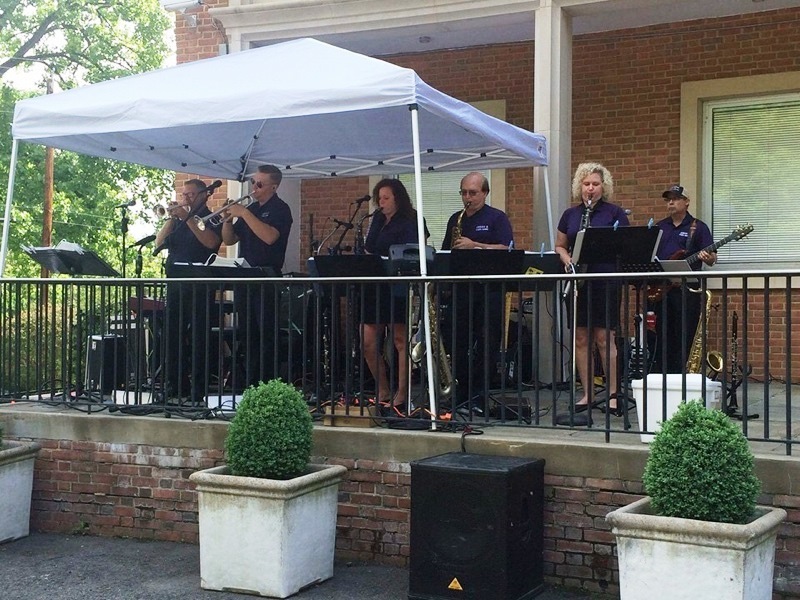 David Czarnek, (2010) who plays sax and clarinet, came to the band from his father’s band, the Texas Dutchmen, and has a background of big band, jazz, country, and rock. 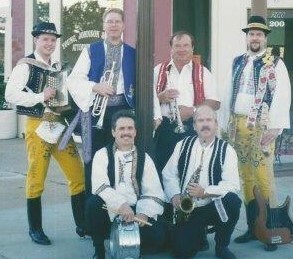 David Slovak (1997), accordionist and piano, played with the Henry Rejcek Polka Band and Czech Harvesters before founding CATS with DZ. trumpet imitating his father. Raymond had learned music while attending St. John’s Nepomucene Catholic High School in Ennis, where he played with several Czech bands while still in school. 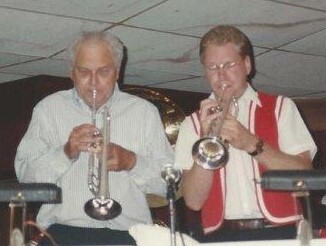 He also taught Kenneth and Nick Mikula the fine points of playing trumpet. Through the years, he continued to play with the Texas Dutchmen, as well as help out a few other bands before cranking up CATS. Harry Czarnek’s Texas Dutchmen had a lot of influence on CATS, mentoring young DZ and Michelle. Gene Patalik and Harry were like second fathers to them, and Gene’s son, “Sonny,” was DZ’s accordion teacher and fantastic trumpet player and arranger. CATS plays many of Sonny’s arrangements today at all of their engagements. Living in the Zapletal house meant you were also involved in promoting Czech heritage. 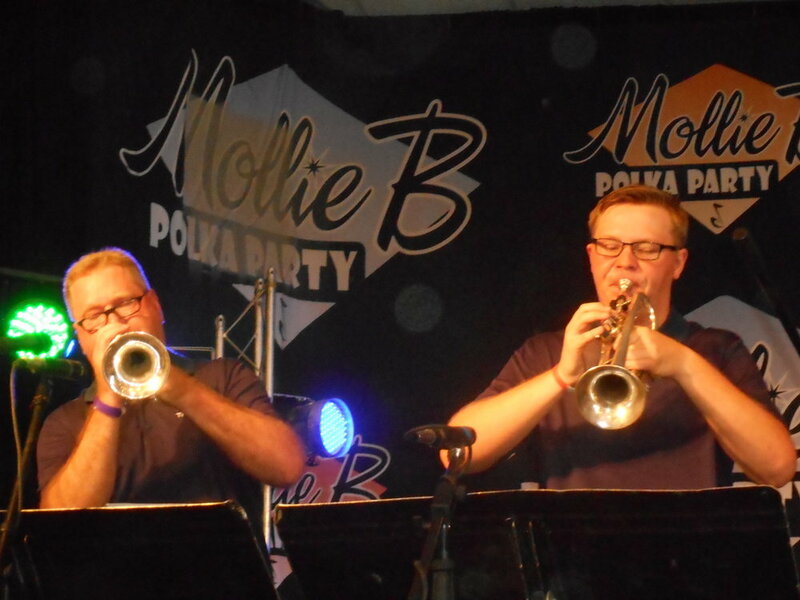 DZ’s dad was one of the co-founders of the National Polka Festival, which has been held on Memorial Day Weekend for many years. The festival celebrated its 50th anniversary in 2016. DZ served for 18 years as the director of festival. Michelle has been the secretary of the festival for over 15 years keeping Czech heritage alive in Ennis. In case you haven’t noticed, the Ennis area has a plethora of young Czech bands. “I think that comes from the musicians growing up listening to Johnny Mensik,” DZ said. “Johnny’s style is a little bit different and jazzy, which catches the interest of the younger folks.